Tall ship A.J. Meerwald; photo by Patty Ali on Flickr (use permitted with attribution). First launched in 1928, the A.J. 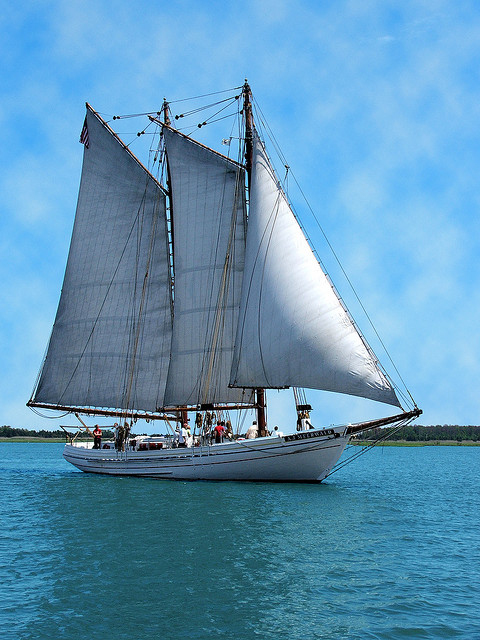 Meerwald is a Delaware Bay oyster schooner, a distinct vessel built to meet the needs of the local oyster industry. Now part of the Bayshore Center at Bivalve, New Jersey, who offer unique, hands-on educational sails aboard the schooner. The A.J. Meerwald was one of hundreds of schooners that were built along South Jersey's Delaware Bay shore before the decline of the shipbuilding industry during the Great Depression. The A.J. Meerwald was added to the National Register of Historic Places in 1995.